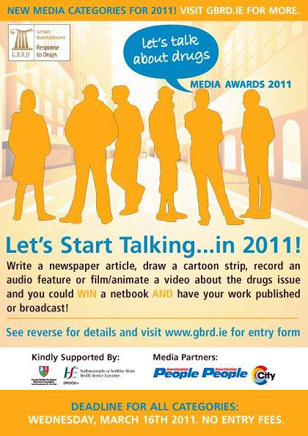 The details of the 2011 “Let’s Talk About Drugs” Media Awards have been announced. The awards, which are in their fifth year, were created to encourage the journalists and reporters of tomorrow to start writing and talking about the drugs issue in Ireland today. These awards are organised by the Greater Blanchardstown Response to Drugs (G.B.R.D), these awards are aimed at primary and secondary school students, college students and aspiring members of the media, to stimulate debate around the drugs issue in Irish communities. Theme 1: Prescription Drugs – problem or solution? Theme 2: Alcohol – is cost the only price? Theme 3: Drug Rehabilitation – recovery is possible? As part of their prize, the winners’ work will be published or broadcast and they’ll also receive a netbook computer. In addition to the category winner prizes, the G.B.R.D will also be presenting the annual ‘GBRD Endeavour Awards’ to an individual and a school. The Judging Panel will include representatives from the organisers, media partners and funding agencies. Download an entry form from www.gbrd.ie and send it with your entry (the judges can’t accept an entry, without a fully completed entry form!). The Judges won’t accept any entries that contain commercial messages or that aren’t original. If you’re quoting a piece of research, don’t forget to include the source with your notes. For the newspaper article category, have a look at last year’s winners on www.gbrd.ie to get an idea of what the judges are looking for. H, i was a patient hunstown/hartstown CDT a few years back, since then i went off the rails abit drinking before doing a Springboard Oppertunities course in Belfast and from that course and a monologue i wrote and acted out i got into college in belfast, I am now doing a HND (acting) in Belfast Metropoliton college and in the last few months I’ve composed two plays, one of which myself and some of my class mates will be producing and performing (outside of college) for the Belfast fringe festival in October, but the other is largely based on experiences, people and attitudes I was met with in my time spent in Meath and Dublin(Laurel lodge road was my address throughout my addiiction). It is seven interlinking monologues that I think carry important messages, i think you will find it interesting to read, and although its not all completely true i think in essence it is. I just wanted to have some of you read it before i try and push for it to be showcased in some way, your thoughts and feedback would be welcomed and greatly appreciated. Please send me an email address i can forward the script to, i hope you’ll be in contact thanks.